When compared to the direction Wes Anderson’s films have taken afterwards, the first two stand out as unique. It’s the general critical consensus that Bottle Rocket and Rushmore are better movies than The Life Aquatic with Steve Zissou and The Darjeeling Limited, but I don’t think the thematic transition from Rushmore onwards has been noted enough. But before I get to that, let me expand on his first film. Though the characters in any Wes Anderson film are never people who have to worry about making a living, Bottle Rocket, co-written by Owen Wilson, features three Texan friends who are, as far as your average film about suburbanites goes, pretty relatable. Anthony is pulled from his voluntary stint at a mental hospital and drawn into Dignan’s plans to become a master thief. Bob, the third and richest friend, is needed by Dignan for the resources he provides; he’s a decent enough guy bullied by his snot of a brother. Dignan’s self-centered delusions are offset at the end when the big heist goes bust and he’s imprisoned; he genuinely seems to be aware of the shortcomings and illusions that got him there. The scene with him walking back into prison from the yard is affecting because, of the three friends, Dignan’s life seemed like the emptiest. He’s the one who had the least resources. There’s rarely such a thing as a voluntary stint at a mental hospital unless it’s a private one, but all in all, these three are the probably the realest (and least pretentious) characters in a Wes Anderson movie so far. 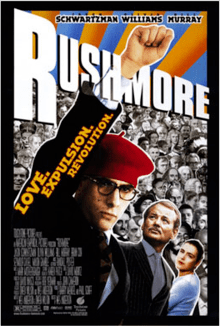 Which brings me to Rushmore (co-written again by Wilson): a movie about a pretentious fifteen-year-old who is the worst student at a prestigious prep school. The one thing Max excels at is writing, and the thing he’s very good at is spending all of his time on extracurricular activities. Max is, as far as we know, the only student at the school on a scholarship – one put in jeopardy by his being put on academic probation. He’s the son of a nice guy who happens to be a barber; his mother, deceased, encouraged the artistic tendencies that got him in the school. You could say Rushmore is about Max’s journey from referring to his father as a doctor (“My father may only be a doctor, but we manage.”) to being able to proudly introduce him, in person, as a barber. And then there’s The Royal Tenenbaums. Where Rushmore’s Max wore his ‘literary’ qualities on his sleeves, the Tenenbaums are all thoroughly literary concoctions. Privileged burnouts could be characters that are involving, but in this film, I feel like they’re all a bit more spectacle than substance. This spectacle quality seeps over into The Life Aquatic, the first movie not co-written by Wilson. The next two writers that Anderson works with are people whose work generally focuses on the privileged side of life—in ways that I think are far less universal than Anderson and Wilson managed in those first two films. Though to be fair, The Darjeeling Limited does have moments that break the monotony of life and people as empty spectacles of art and whimsy.